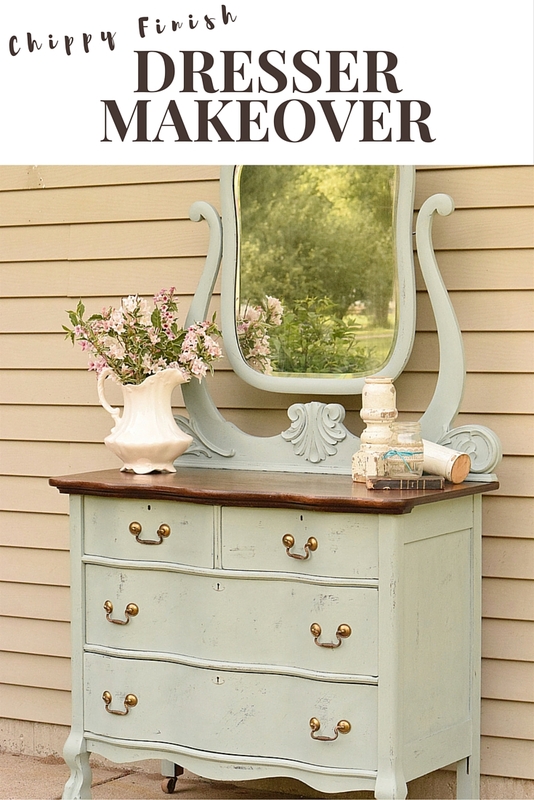 Oh friends, we are warning you now…be ready to swoon…We think this is one of our favorite makeovers to date! 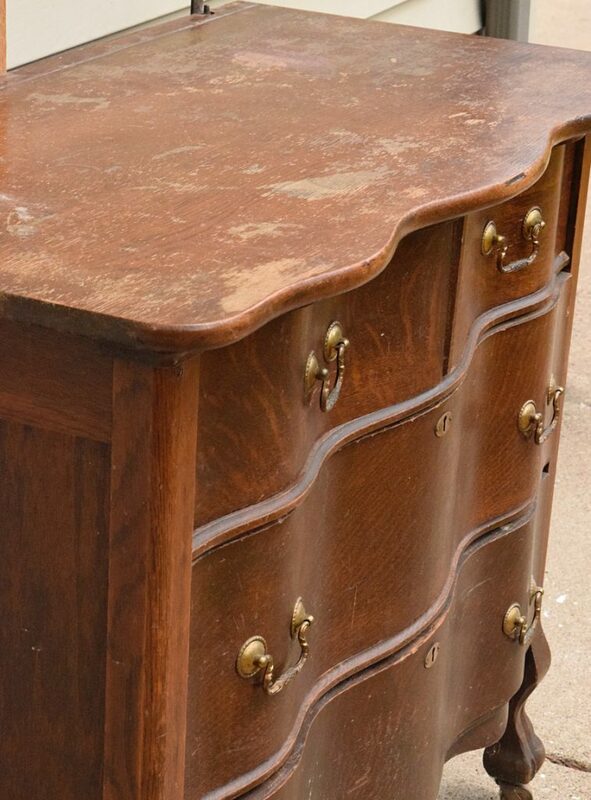 Kristen found this curved front dresser at a garage sale that she just randomly stopped at. 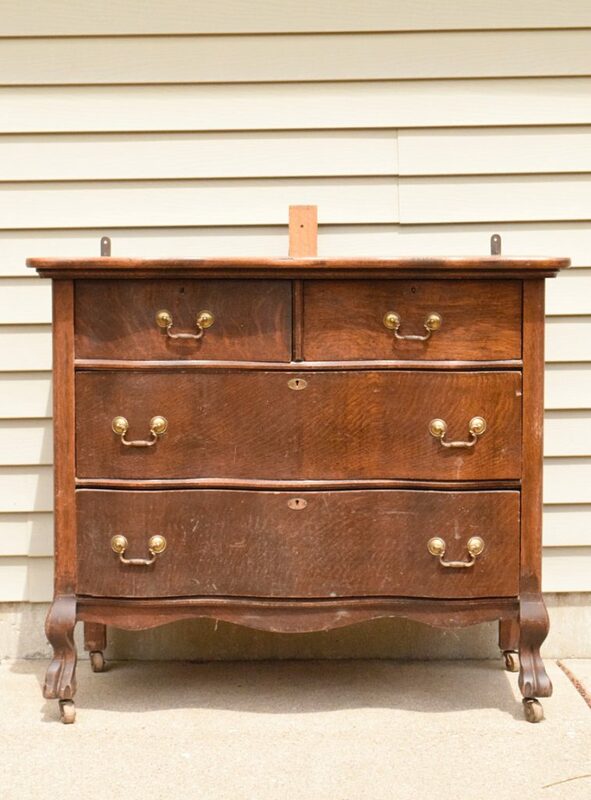 And thank goodness she did stop, because once she saw this dresser we just had to have it! 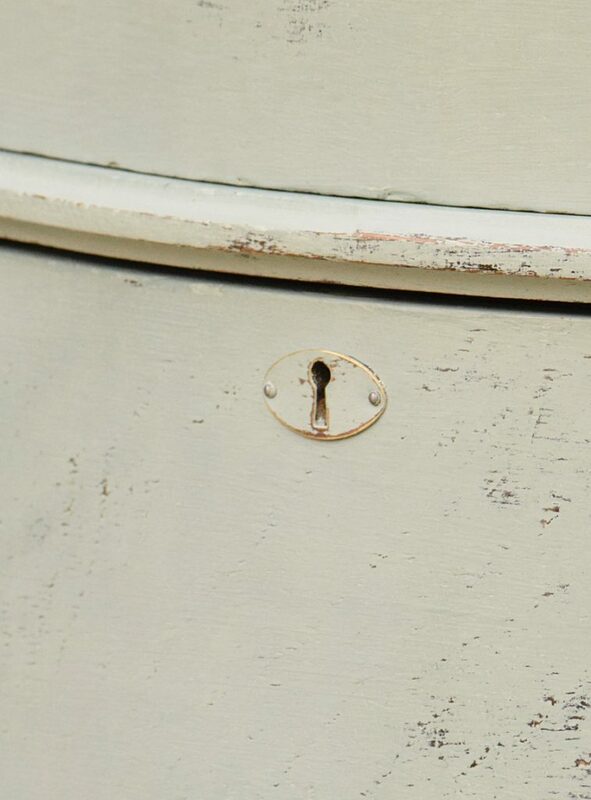 It had a couple knots on the inside of the drawers that needed repair as well as a very rough looking top that definitely needed to be sanded down. For your convenience in locating products we have used, this article contains affiliate links. All products are items we use ourselves and genuinely recommend. If you make a purchase after clicking a link, we will earn a small commission at no additional cost to you. For our full disclosure go to our “Disclosures” page. 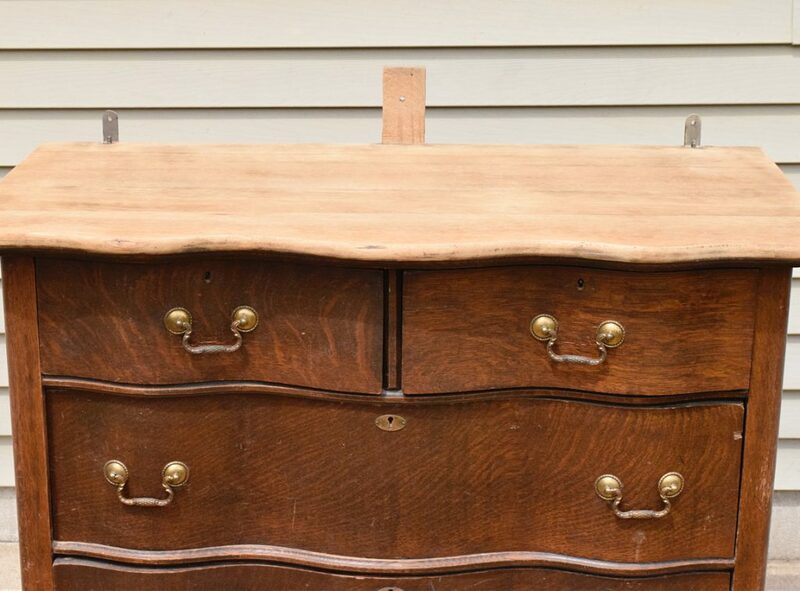 After sanding the top to the raw wood (using our electric sander) and wiping it all down with soap and water the dresser also needed some wood filler for some chips and scratches on the drawers. 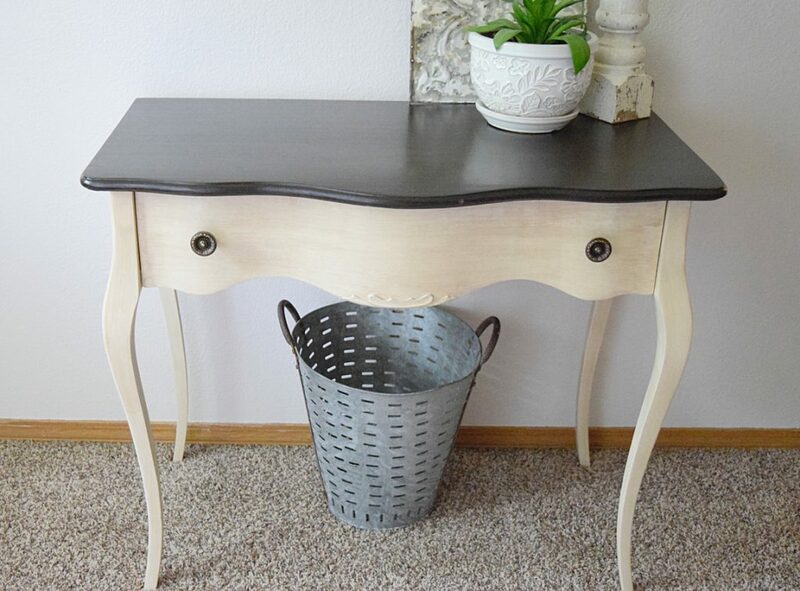 We then stained the top with a beautiful medium brown stain which gave it the gorgeous color. 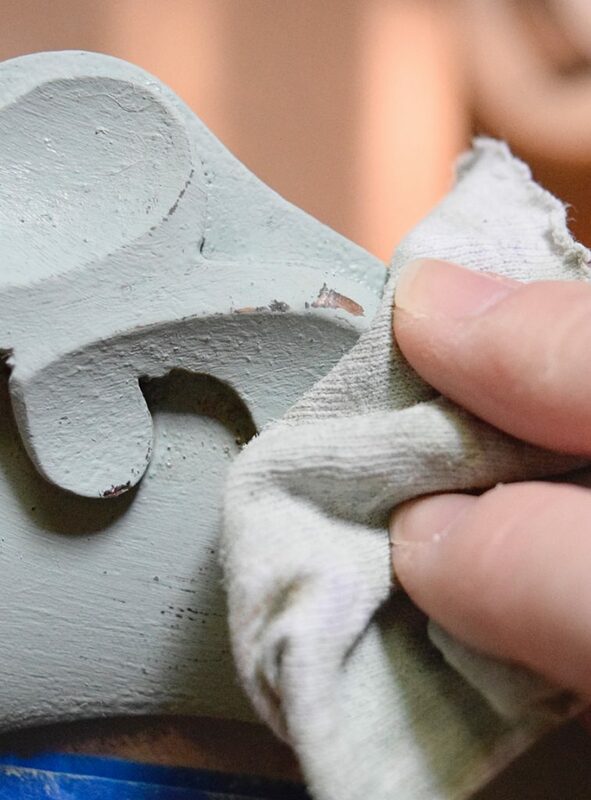 For the paint, it was an easy 1 coat application to the entire frame and the drawers since it covers so well and we knew we would be distressing the piece down anyway. The fixing and paint process was really quick even though there was an entire mirror frame to paint as well. But only needing to apply one coat is just amazing and saves so much time! 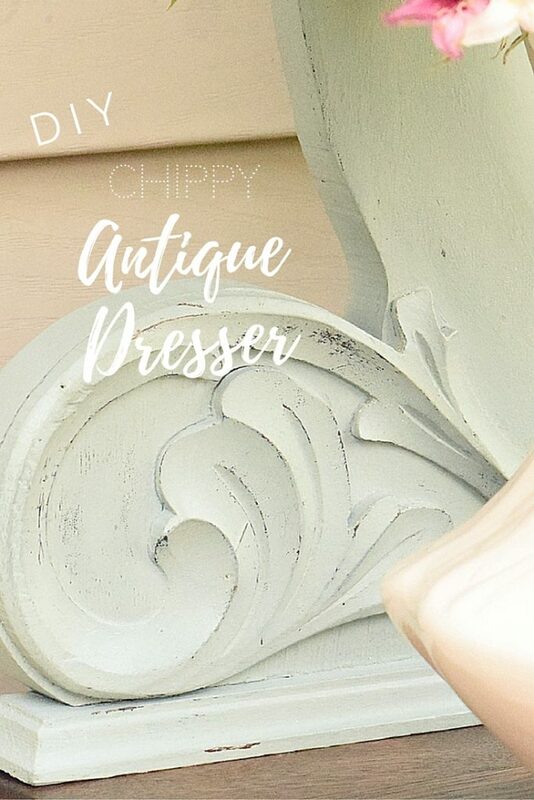 For the next step of trying to achieve a chippy look with chalk paint, there was a new technique that we hadn’t used before but had wanted to try. 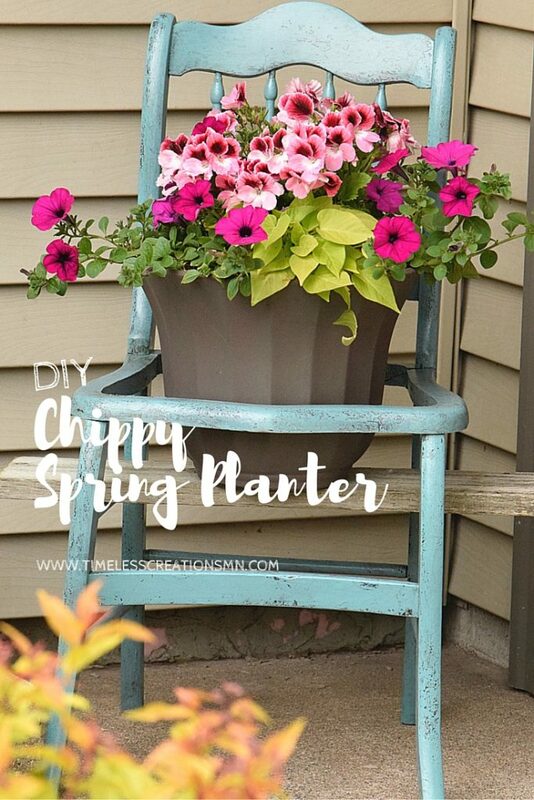 Kristen read that mixing white vinegar and water as a 1:1 ratio in a spray bottle and then spraying it onto the dried chalk paint, then wiping, you can create a chippy look. So…we tried it! First we took a plastic putty knife and tried to chip it off, but it didn’t work well and we didn’t want to scratch the underlying wood. So instead, we took a dry cloth and started wiping it off. In some spots more pressure was used and other spots we used a fingernail under the cloth to take even more off. The cloth worked really well and we felt like it was almost easier to do than using sand paper to distress. 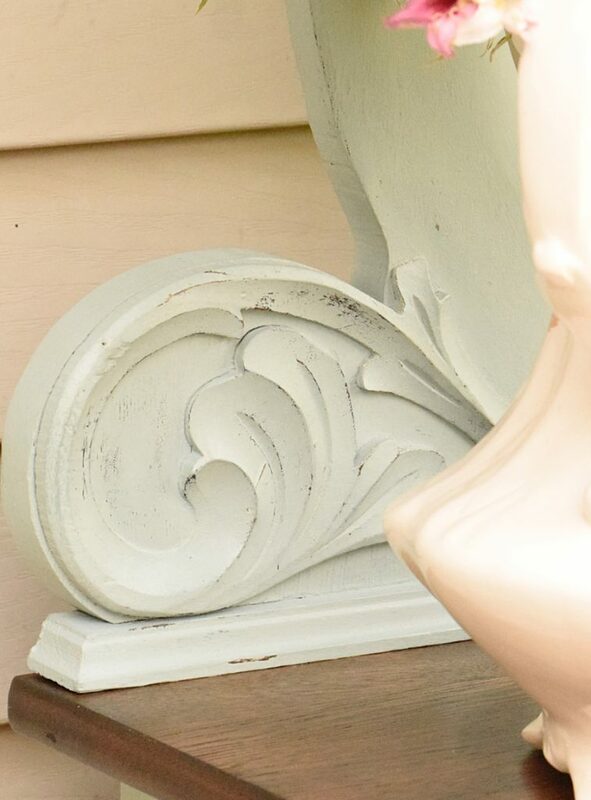 Even though it’s not what one may call a true “chippy” look, but we felt like it gave the finish a different look than distressing with sand paper. 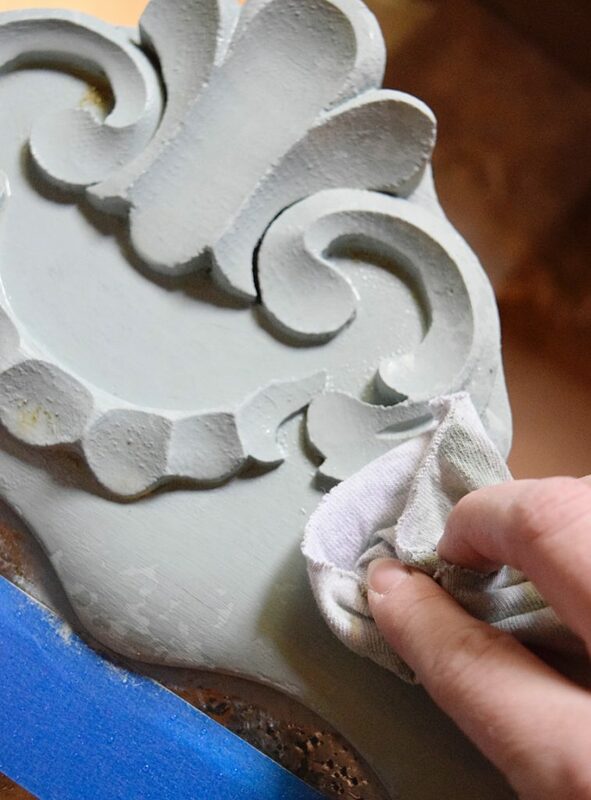 We really concentrated on the edges of the piece but was also able to take a lot off the front and sides a lot easier with this technique. The final look is exactly what we were hoping for and we really love it! 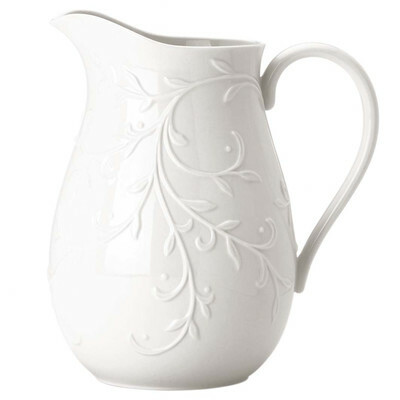 Funny little side note from Kristen: those flowers in the white pitcher are actually shoots from my bush in the front because my puppy, Kirby, completely destroyed it last fall thinking it was sticks he could play with. This spring when it came back, we had new shoots coming from the ground and about 5 long ones he didn’t get to destroy, so I just had to prune it down! 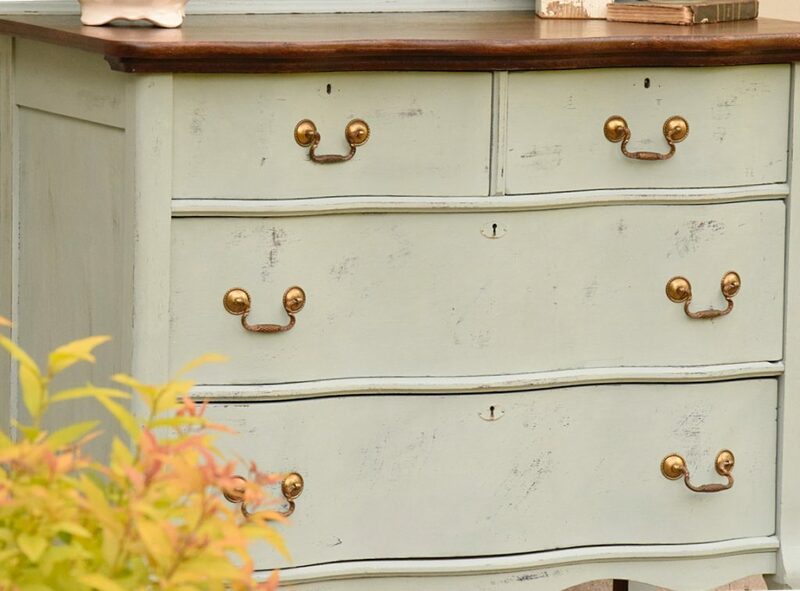 Anyway…back to the beautiful dresser makeover.. We just absolutely love the character of furniture pieces that have a curved front. And we cannot be any more thankful that Kristen decided to stop by that small town garage sale that random day! 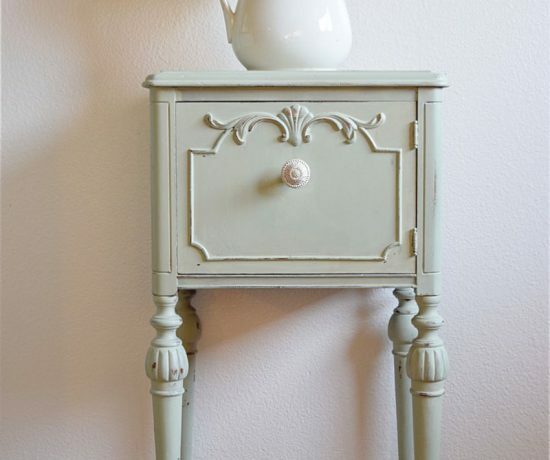 All the antique furniture pieces have such great bones that they stay sturdy pieces forever. Even though they have wear-and-tear from all the years, they are just too precious to pass up. They turn out to be such stunning makeovers! 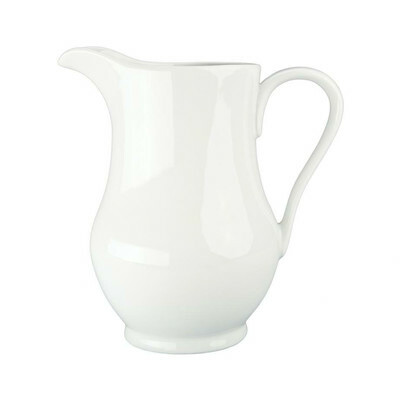 Did you like that perfect farmhouse pitcher I used to hold the flowers? 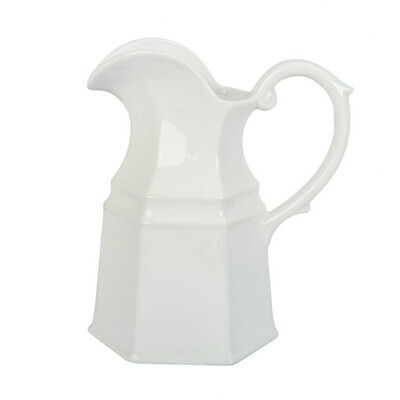 This was a “found” item from a garage sale, but if you are impatient to wait to find an old one I found some really great white ceramic options online you can get now! This is so pretty! 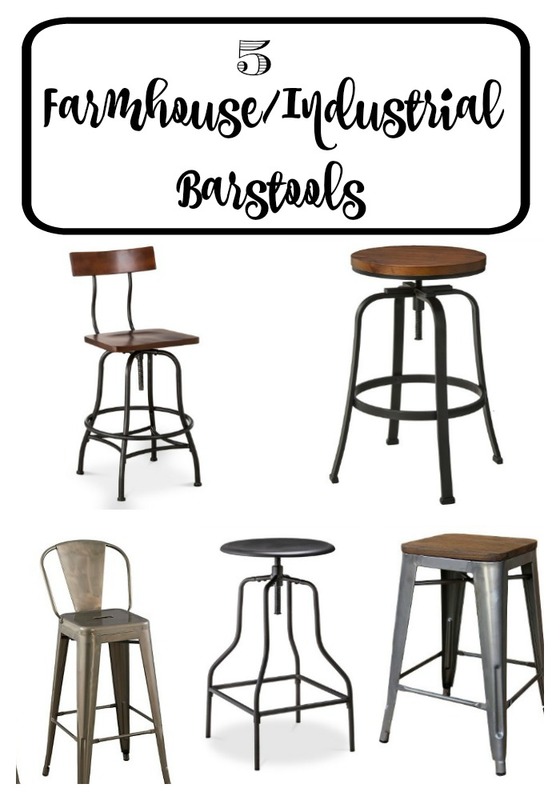 I pinned it to one of my furniture group boards. I love the color you chose! Thank you so much Bre! We just absolutely love the color too! A Furniture Group board?! Is there any way we can apply to be in that group board as well?! 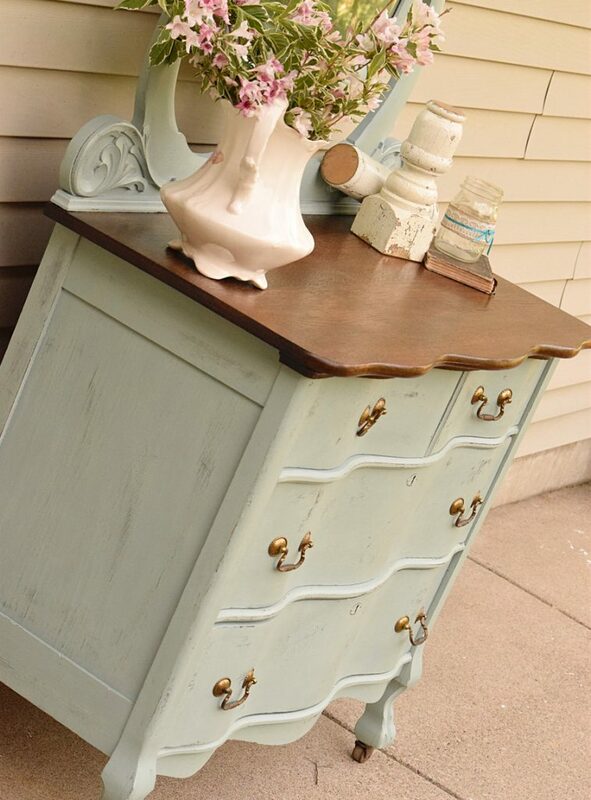 I am in love this is one of the prettiest re-do i have seen… it ranks up there, will pin it, there are lots of pretty re-do out there, but something special about the color and furniture piece you picked. Oh Maria, thank you so much for your kind words. We appreciate them! 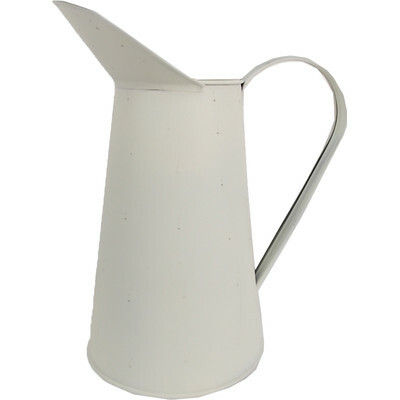 I almost passed this little beauty up because it was more expensive than I wanted to pay…So glad I got it! It was a fun re-do. Thanks for the pin too! This is beautiful! I just love the color! Oh Thank you so much Michelle! 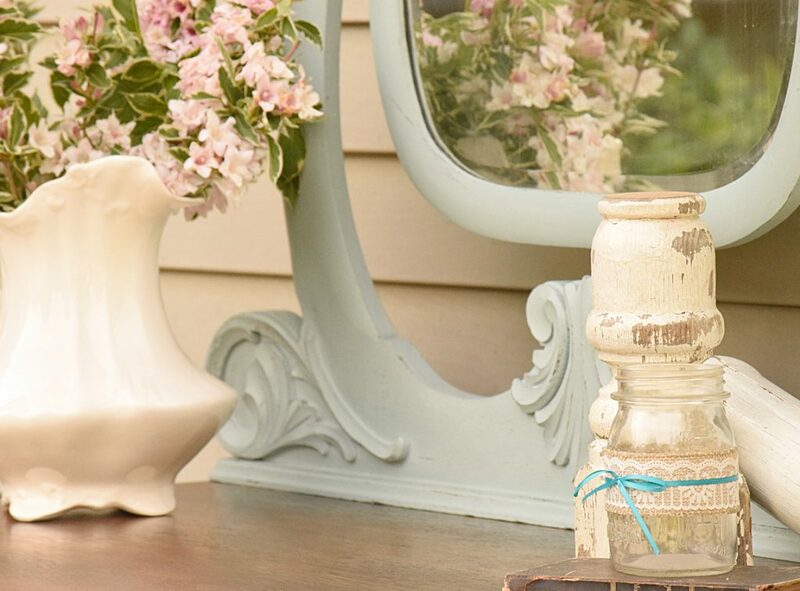 Duck Egg is one of our very favorite Annie Sloan’s paint! 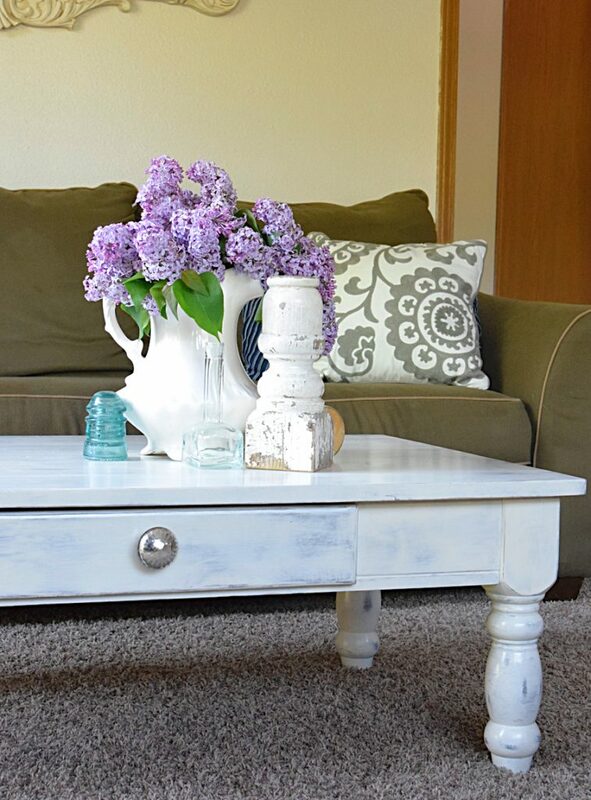 Beautiful Job on this makeover! Please share with us at the Thursday Favorite Things Link Party live each Wednesday tat 8:00 p.m. I would love to share one of your beautiful creations! Thank you so much Debi for stopping by! Thank you for the invite to join your link parties, we will definitely be adding it to the calendar! Love this piece! Such a pretty color. 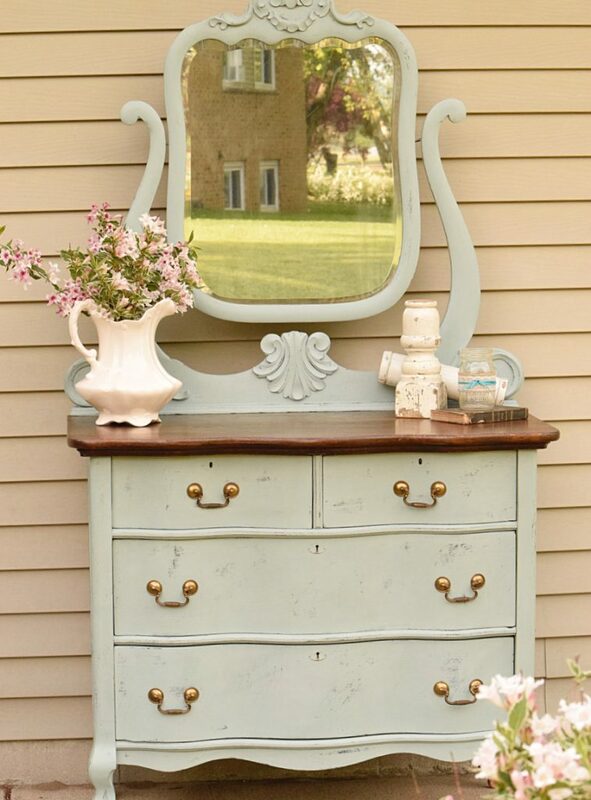 Such a beautiful dresser! 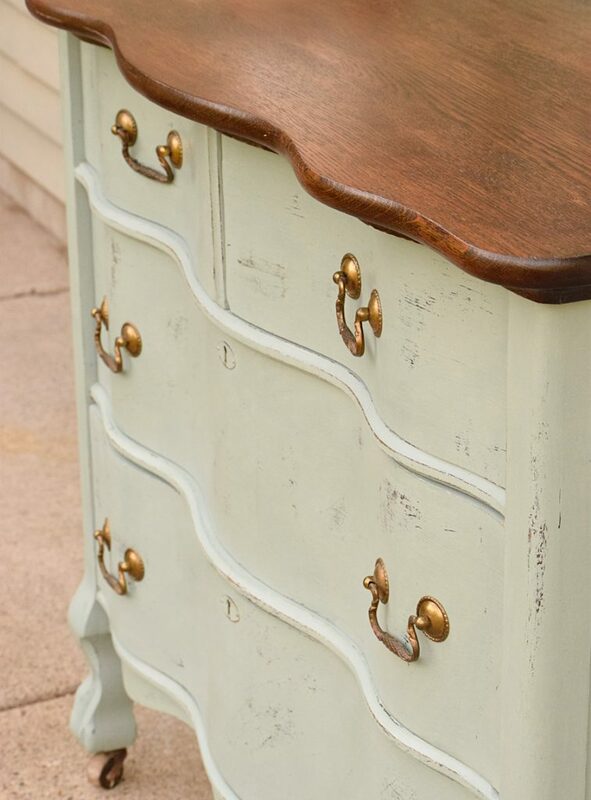 Love the color against that stained top! Thanks for sharing at Dream. Create. Inspire. Link! 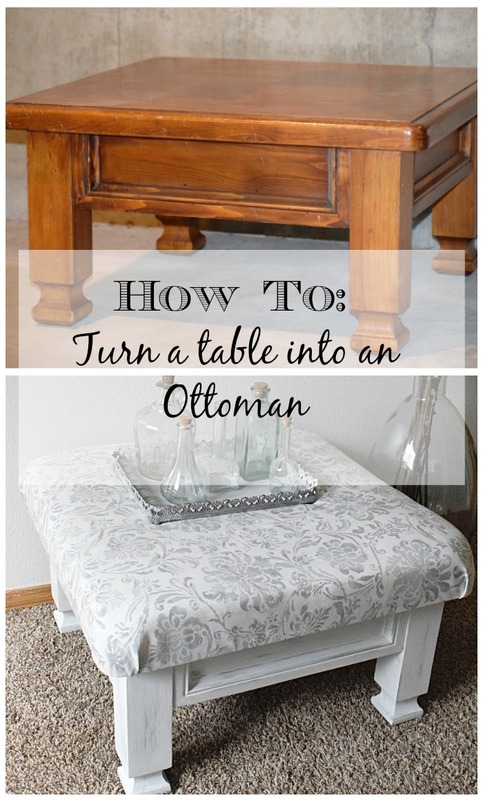 I love furniture makeovers! Thanks for sharing. It doesn’t even look like the same piece of furniture. I just love your color choice. So glad you share with us at Merry Monday. Thanks Shirley! We love that color too! Thank you for Hosting the party! 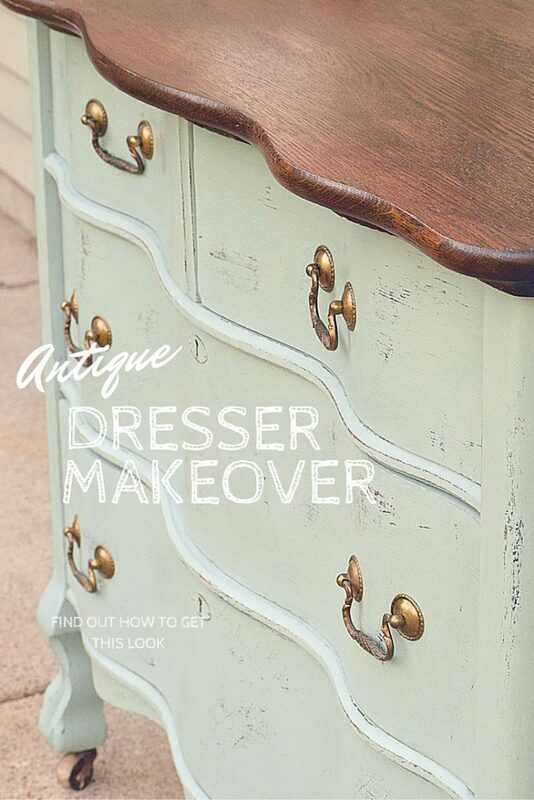 You really gave this antique dresser such an elegant look. I really love that duck egg blue color! Thank you so much for sharing this with us at Dishing It & Digging It! Thank you Angie! That is one of our favorite colors too! Amazing transformation. Thank you for sharing with us at #HomeMattersParty. We would love to have you again next week. Thanks so much for visiting, Sahana, we will definitely be back for more link party fun! What a beautiful transformation!! Love the paint and wood look combo!! 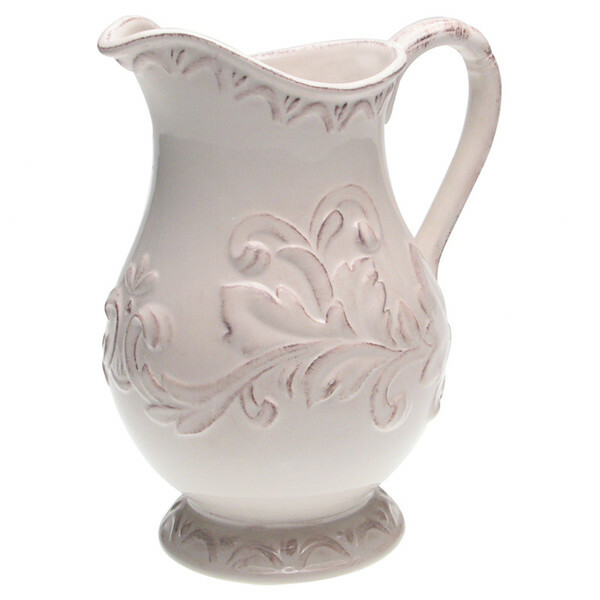 I’m glad the flowers came back, and they look great in the pitcher! 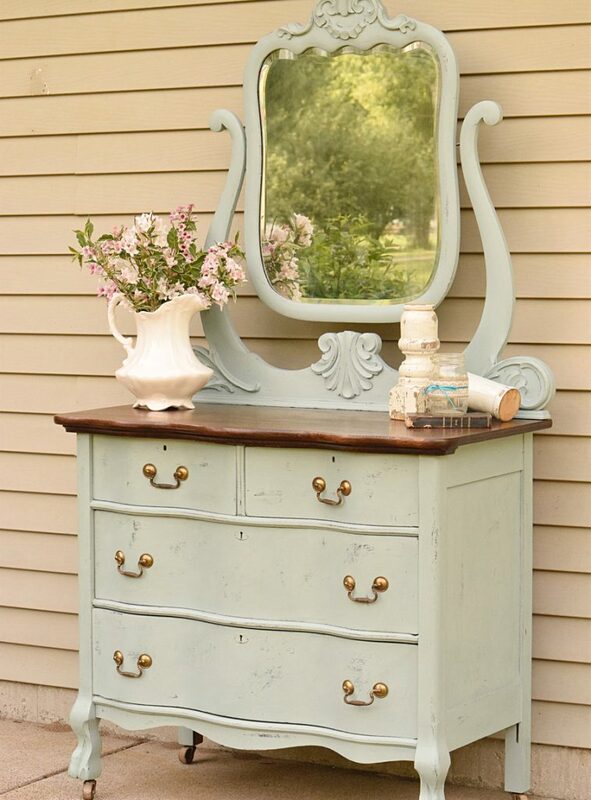 Your Dresser turned out beautifully. You’ve inspired me to get to work this weekend.